God's Word, the Bible, declares that unless a man is "born again" he cannot see the kingdom of God or heaven (John 3:3). The most famous verse in all the Bible is probably (John 3:16), this verse declares that "whosoever believeth in him (Jesus) should not perish but have everlasting life." To perish is to be lost for all eternity in an awful place called hell, separated from a holy God. To be "saved" is to escape hell and have eternal life in heaven with God. The question of, "How can one have their sins forgiven and have eternal life in heaven?" is one that has been confused by many throughout history, yet their confusion is nothing more than a failure to see the clear teaching of the Bible. God does not want you to be confused on this all important issue, therefore He has plainly revealed in the Bible "What You Must do to be Saved"! A. Regardless of your nationality, heritage, or position in life, God says in (Romans 3:9-10) "What then? are we better than they? No, in no wise: for we have before proved both Jews and Gentiles, that they are all under sin; As it is written, There is none righteous, no, not one:"
B. (Romans 3:23) "For all have sinned, and come short of the glory of God;"
- "Sin" - basically is to disobey God, to act contrary to God's holy character and law. The word sin comes from a word which means literally "to miss the mark." The standard we need to measure ourselves by is not other people. Compared to other people you may not be too bad at all. But the standard is God and compared to Him you "fall short"! (Romans 5:12) "Wherefore, as by one man sin entered into the world, and death by sin; and so death passed upon all men, for that all have sinned"
- Sin is the reason we die and your sin is why you can not go to heaven and the reason you need to be saved! (Romans 6:23) "For the wages of sin is death; but the gift of God is eternal life through Jesus Christ our Lord." A. A holy and just God must punish sin. You would expect a just God to judge the sins of men like Adolph Hitler, Ted Bundy, Robert William Picton, etc. But God must judge your sins as well. B. To understand the full punishment of sin and what is entailed in the "death" that is the wage of sin, read (Revelation 20:11-15) "And I saw a great white throne, and him that sat on it, from whose face the earth and the heaven fled away; and there was found no place for them. And I saw the dead, small and great, stand before God; and the books were opened: and another book was opened, which is the book of life: and the dead were judged out of those things which were written in the books, according to their works. And the sea gave up the dead which were in it; and death and hell delivered up the dead which were in them: and they were judged every man according to their works. And death and hell were cast into the lake of fire. This is the second death. And whosoever was not found written in the book of life was cast into the lake of fire." C. Notice (verse 14) The casting into the "lake of fire" (Hell) is called the "second death". 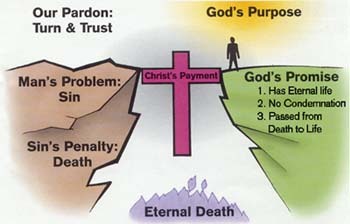 The punishment of sin is both the first death (physical death) and the second death (separation from God in hell). III. The Remedy For Sin! A. (Romans 6:23) "...but the gift of God is eternal life through Jesus Christ our Lord" Although we deserve to perish, God loves you so very much that He wants to forgive your sins, save your soul and give you eternal life. He paid the ultimate price to make this possible. B. (Romans 5:8) "But God commendeth his love toward us, in that, while we were yet sinners, Christ died for us." C. How can we receive this wonderful gift? (Ephesians 2:8-9) "For by grace are ye saved through faith; and that not of yourselves: it is the gift of God: Not of works, lest any man should boast." D. Good works and keeping God's commandments are important but this cannot wash away your sin. God's law is the holy standard of God which points out how we don't live up to it. Suppose you were driving down an unfamiliar highway at 100 km/h and suddenly you see a sign telling you that the speed limit is 60 km/h. You must acknowledge that you were breaking law. Similarly, God's Law points out the fact that we have fallen short, we have sinned. Trying to keep the law from now on will not erase your past sins, and they are not unnoticed or forgotten by God! E. So if you cannot be saved by keeping the law or by your own good works and personal goodness, (Romans 10:3, Philippians 3:9) then how can you have your sins forgiven and be saved? (Romans 10:9-10) "That if thou shalt confess with thy mouth the Lord Jesus, and shalt believe in thine heart that God hath raised him from the dead, thou shalt be saved. For with the heart man believeth unto righteousness; and with the mouth confession is made unto salvation." F. "That if thou shalt confess (agree that Jesus Christ is the Lord and the only Savior) and shalt believe in thine heart..." Jesus Christ died in your place to suffer the penalty of your sin. This is how a just God can pardon your sin, because Jesus took the punishment for you. He was your substitute when He died on the cross as a sacrifice for your sins. Then He arose from the dead. G. Notice that He said to believe in your heart. Many believe in their head that Jesus Christ lived, died and arose from the dead, but are not saved. Faith from the heart is TRUST. Understanding that you have sinned and deserve to die and spend eternity in hell then you humbly turn to Jesus and trust Him (because of what He has done for you) to save your soul, to forgive your sins! H. (Romans 10:13) describes how this is done. "For whosoever shall call upon the name of the Lord shall be saved"! I. This is what God says you must do to have eternal life. Sin must be dealt with and forgiven, and the blood of Jesus Christ is the only thing capable to do that. Salvation is received by Faith, which is coming as a condemned sinner and calling upon Him for salvation! "Dear Lord Jesus, I know that I have sinned and do not deserve to go to heaven, but I believe that you love me and died in my place. Please forgive me and save my soul. I want to love and follow you. Thank you Lord for your salvation! Amen"